'It's bedlam all round," Noreen Doherty says about the countdown to Donegal's game with Tyrone in the final round of the 'Super 8s' at MacCumhaill Park tomorrow. Doherty is the full-time administrator for Donegal GAA and has been involved with the association from a local level since she was a teenager. In 1991, she became the first ever female county board secretary, a position she held for 14 years, and she was also the first woman to be appointed county delegate to Central Council. Doherty is stacked with experience when it comes to the art of GAA administration. So, when she says it's been bedlam, it's clearly been a fairly busy build-up. Because an All-Ireland championship game is coming to town. Think August Bank Holiday weekend and it's been Croke Park and All-Ireland quarter-finals. It's a time when locals would escape to the coast to drain the last drop out of the summer leaving Dublin city in the hands of jersey-wearing supporters and tourists. 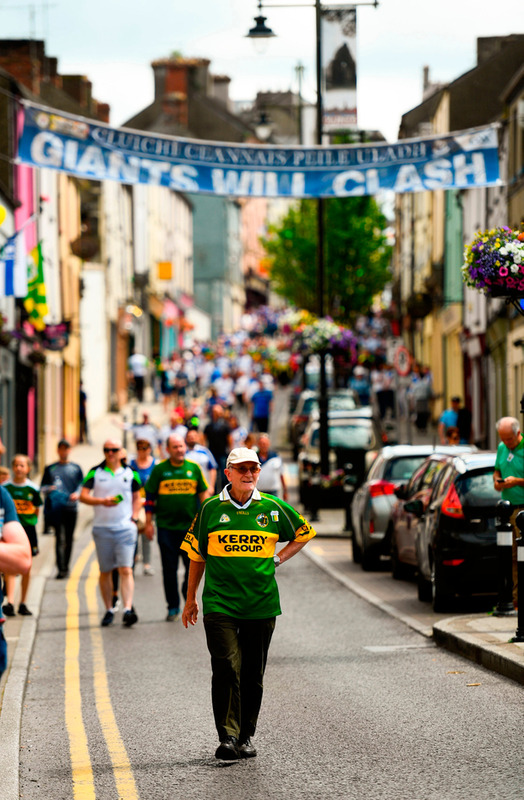 Besides the Dubs' dead rubber with Roscommon, this August Bank Holiday weekend has been reclaimed to Donegal, Galway and Kerry - counties which know a thing or two about attracting a crowd in high summer. So, Galway's game with Monaghan at Pearse Stadium this evening gets dropped into the madness of Race Week in Galway. What's an extra 15,000 in Killarney on a bank holiday weekend for Kerry's game with Kildare in what will be one of the biggest weekends of the year in the town? Donegal's duel with Tyrone in Ballybofey has been a sell-out since last week with 16,000 tickets snapped up. Doherty reckons they could have sold 25,000 such was the level of interest. "It's been bedlam. Since we (Donegal) beat Roscommon and Dublin beat Tyrone then this match became a big, big event," Doherty says. "We started the planning process on the Monday after that weekend. It is a unique occasion because we have never had this type of game in MacCumhaill Park." The workload of an administrator is a never-ending check-list for occasions like this weekend's Super 8s finale. It includes meetings with the Gardaí, the local council, the HSC, the Order of Malta, the fire service. It involves working with the local bus service to make sure there's an increase in frequency of buses going from the city to Salthill like for Galway's game this evening. It involves looking after match tickets, programmes, stewarding, media access, wheelchair access, VIP access, who's going to sing 'Amhrán na bhFiann', catering, parking, over-flow parking and asking the parish priest in Killarney for the use of the car park near the cathedral and giving a donation in return. And then there's the pitch - the cutting of it, the lining of it, the perfecting of it. Fitzgerald Stadium committee chairman Der Brosnan said they sunk a well into the grounds of the stadium around eight years ago so they have an irrigation system which helped them during the heatwave in order to maintain the condition of the pitch. And there was us thinking that Kerry going to the well was some sort of easy metaphor. Killarney will throw up its own traffic management challenges this evening but Brosnan says they always plan with the approach of over-estimating the attendance rather than underestimating it. "We had 17,000 for the Clare game. We had 12,000 for a National League game here at the end of January so if we can get 12,000 in January, surely we can get more than that (tonight)," Brosnan adds. "We like to see everyone enjoy themselves, get in safe and get out safe. The more people that come in through the gates, we get a percentage. This is one of our revenue days." Game day at Pearse Stadium will be an early start for Galway GAA secretary John Hynes ahead of the 6pm throw-in. "I'll be there at 7 o'clock in the morning. There needs to be a safety inspection of the ground to make sure there's nothing untoward - no storm damage or low structural issues to the ground. So, a safety officer would conduct that at 8am," Hynes explains. "Then there would be the Garda Síochána - they would do a security sweep, come in and check the stadium, check all the alcoves, check the bins, check the offices just in case there is any suspicious item left there. And when the stadium is passed fit to open, it is then open for the stewards. The stewards start coming in and they get tea and coffee and sandwiches. "They are given their bibs, they're briefed, they go to their positions. And then the gatemen arrive - they take charge of all the access, make sure the ticketing is done right and then the people enter the stadium. It's a big logistical challenge that is met, mostly, by the excellent volunteers that we have here in Galway GAA." With an expected attendance of between 15-18,000, Hynes says they have to prepare for the unexpected. "There's lots of things that could happen - a very significant downpour of rain, supporters could arrive late - how do we cater for that and get them into the stadium as quickly as possible?" Hynes adds. "There could be a power outage, that would affect the scoreboard, it would affect our scanning system, but we've all those issues covered in our contingency plans." For the rest of us, it's just about the game but Doherty says she won't be able to enjoy the day tomorrow in Ballybofey until she knows everything is ok. "You do be anxious in the morning, until everything starts and once the match starts and the crowd are in safely, you do relax then." And with that Doherty is off to complete the next task on her checklist for an August Bank Holiday weekend like no other.